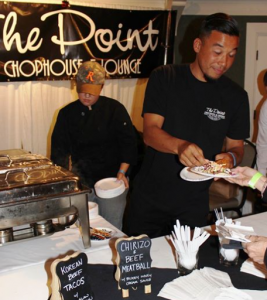 The summertime bounty of events in Santa Cruz continues; here are a few highlights for the weekend of Aug. 5-6, 2017, including refreshment options at the annual Church Street Fair. The Church Street Fair is part of the Cabrillo Festival of Contemporary Music, which lasts until Aug. 12. As usual, there will be music, dance, art, food, and wine. 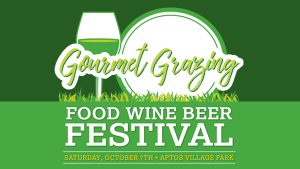 Participating breweries and wineries include Corralitos Brewing (noon-3:30 p.m. Saturday), New Bohemia Brewing Co. (4-7 p.m. Saturday), Santa Cruz Mountain Brewing (noon-3:30 p.m. Sunday), Uncommon Brewers (4-7 p.m. Saturday), Storrs Winery, Odonata Wines, Soquel Vineyards, Rexford Winery, Alfaro Family Vineyards & Winery and Birichino Wines. Vinocruz—which is opening in Soquel soon—will be pouring the wine both days. Falafel of Santa Cruz, the chefs from Prophet Elias Orthodox Church who put on the annual Greek festivals, food truck G’s Tacos, and Efi’s Dutch-Indo will sell food on both fair days. 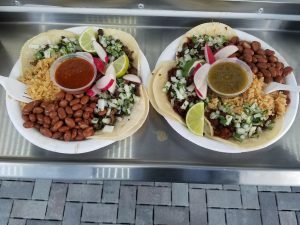 Food truck Ate3One will participate on Sunday. Event organizers promise that “non-stop performances from global traditions will keep your spirits high as you select from a variety of local food purveyors, vintners and brewers, and explore the work of dozens of regional artists and craftspeople” (see site for entire performance schedule, which includes Flor de Cana and Broken English Saturday & Watsonville Taiko Sunday). Friday night, lots of food and drinks will be at various galleries, shops and museums (including a fun-sounding balloon-centered exhibit at MAH) for First Friday Santa Cruz. My Mom’s Mole will be at Corralitos Brewing Co. Saturday afternoon & evening, and also the first Saturday of September & October. Service is 3 p.m. ‘til 8 p.m. unless they sell out earlier. And yes, I know this isn’t in Santa Cruz, but I wanted to mention anyways, especially since it’s the first of a series of three!